The Small Business Energy Initiative (SBEI) is led by the Institute for Market Transformation (IMT) and the Greater Cleveland Partnership/Council of Smaller Enterprises (GCP/COSE). With support from the U.S. Department of Energy, the Initiative is partnering with local chambers of commerce and similar small business organizations from five regions across the country to arm them with leading-edge tools, best practices, and guidance to create energy efficiency and sustainability opportunities for their small business members that are good for the bottom line and good for the planet. In our SBEI Q&A series, we learn from the changemakers who are rolling up their sleeves every day to build an energy-efficient and prosperous future for businesses and local communities. Watch the video below for Aaron’s message to summit attendees about how climate change is creating immense challenges but also significant opportunities in North Carolina and across the U.S. for job growth, innovation, and new collaborations that benefit local businesses. Why did the Chamber for a Greater Chapel Hill-Carrboro become involved in energy efficiency and the Small Business Energy Initiative? As a chamber of commerce, how can I help my business members save more money than they pay me? It’s about returning real value for local businesses, and we saw energy efficiency as a way to do that. Through the Small Business Energy Initiative, we are able to create an easier pathway for organizations to take action on saving energy. In addition to providing a free energy audit that identifies the best energy conservation measures to take, having the ability to provide solutions like green leasing changes the conversation with a building owner or tenant because it shows them how to align motivations and remove the split incentive—which is usually one of the biggest roadblocks to more efficient buildings. We are seeing more property owners, tenants, and brokers showing interest in green leasing and we are working to capitalize on that. Another goal for our chamber was to get other area chambers involved in energy efficiency. Through SBEI we recruited Alamance County—which is a big manufacturing and rural county, and Durham County. We can now offer free energy audits and support to drive building efficiency improvements for businesses in both of these areas as well as in Chatham County. We planted a seed for energy efficiency and it’s exciting to see it grow. 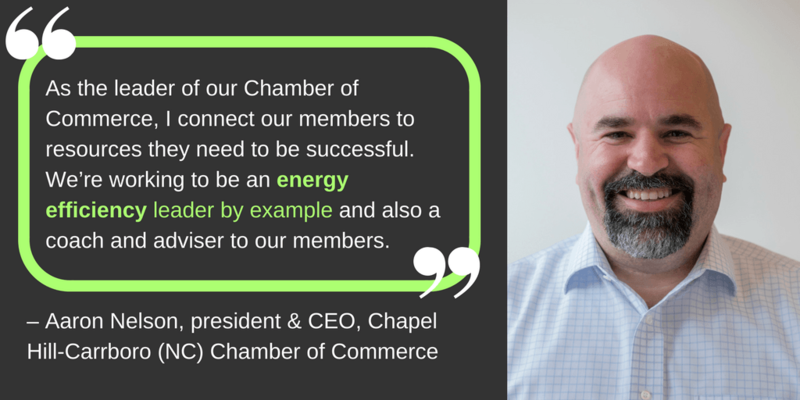 How did your chamber first become a member of the Small Business Energy Initiative? I met Nicole Stika of the Greater Cleveland Partnership/Council of Smaller Enterprise (GCP/COSE) in Doha, Qatar at the International Chambers of Commerce’s World Chambers Congress. Nicole and I were both invited to present on how chambers can help their members ride the wave of sustainability. While I was there I learned about the great work Nicole and GCP/COSE were doing in Cleveland to help businesses save energy, and that got me interested in the major potential of energy efficiency and high-performing buildings. Around the same time, the Chambers for Innovation and Clean Energy (CICE) was being created, and I became the founding co-chair of its advisory council along with the President of the San Francisco Chamber of Commerce. 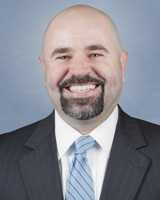 Nicole and Doug Luciani from Traverse City also serve on CICE’s advisory council. When Nicole reached out to ask if Chapel Hill-Carrboro was interested in joining SBEI to connect more of our local businesses with opportunities to save energy and meet the triple bottom line, it felt like a natural fit. We were also looking broadly at tackling pollution and waste reduction, but this gave us a chance to really focus on building efficiency. What challenges have you encountered while trying to engage small businesses on energy efficiency and what kind of progress do you hope to achieve through the Small Business Energy Initiative? A big challenge we come across is attaining mindshare from small business owners. Sometimes energy doesn’t even fall within the top 10 concerns of a business owner. How do we elevate energy efficiency to one of their key priorities and then motivate them to take action? First, by educating them on the immense business, environmental, and social benefits that higher-performing buildings provide, and second, by creating a pathway to make it easy for them to invest in making improvements. Whether a business wants to reduce its impact on the environment, save money, or do both, we help them take the first and best step to get an energy audit and then put a plan in place that will move them from audit to action. We have no trouble convincing people they should be more energy efficient. But if I’m realizing I need to lose weight it’s a whole different thing to get me to the gym. So through SBEI we first help you get a physical, second a free consultation at the gym, and third a long-term diet and exercise plan to help keep your building healthy and in shape. How are you collaborating with other local entities on energy efficiency? Are you working with your utility? Chapel Hill-Carrboro is fortunate to have access to Duke Energy’s turnkey energy efficiency program that provides an energy audit to any customer for free and writes them a prescription for potential changes to make. Not only that, the utility funds 80 percent of retrofit costs, and helps implement the upgrades. One example is about a small grocery store that worked with the utility to upgrade its lighting and refrigeration system. The project paid for itself in less than a year and is saving the store around $1,000 a month in energy costs while providing a well-lit environment for its customers. Why do you think a chamber should create an energy efficiency program? If you are in the business of delivering value to your chamber’s members and helping them navigate complex issues, then helping them figure out energy issues is exactly something you ought to be doing. Our members are proud of us for our involvement with SBEI—to be part of a chamber that is working on innovative and forward-thinking business solutions that are good for the environment. We think it bolsters member recruitment, retention, and our influence at the town hall. At programs and events we are always talking about our work with SBEI. It gives us a useful talking point on how we deliver value in the community, where our electorate and elected officials are interested in energy efficiency, and they know their chamber and its members share their values. Climate disasters like what we experienced with Hurricane Florence are making it even more obvious that we need to pay attention to climate issues, community resiliency, and business resiliency—energy efficiency is top of mind for helping to address each of these issues. This energy efficiency action guide contains helpful tools, resources, and best practices for chambers of commerce and small business organizations that want to help small businesses reap the immense benefits of higher-performing buildings.